Valentines day came a little early this year. No the SO and I did not go out and do something (as you will find out later, I can't stand the day so I go out with my girls and not the SO). I'm talking about the socks I knit. The socks where Saint Valentine (the Roman dude now known as the saint of lovers), Juno (the Goddess of women and marriage), or the high-pitch-wicked-excited teenager on a puppy love high, vomited on my feet. Pattern: Kinda my own. Kinda. Basic provisional cast-on and knit the toe. I use additional reinforcement elastic thread when working the toe (and the heel). Oh, and I have now decided that my toe-up socks will need to change. I have made a couple of socks now and I have decided I make the toe too narrow. I mean these would go great in a nice pair of pointy shoes. But lets face it, pointy stiletto heels, my hand knit socks, and a molecular biology lab don't mix. So I'm going to have to revamp my toe. I'll do some reading up on toe variations. If you have any suggestions I'd love to hear about it (as usual via comments or slroy10 at gmail dot com). Repeat the 4 rows for as long as necessary. I actually made these socks a little too big. These might fit a size 8 instead of my size 7 foot. But it's okay, I've been wearing double socks lately so I can just layer these over another pair! I think what I did is called an afterthought heel. But I'm not exactly sure. I'm going to pick up a sock book and learn a little more about different types of sock construction. Again, I held the elastic reinforcement thread for the heel. Rejoin and do the 4row repeats all the way around. End with a picot bind-off. 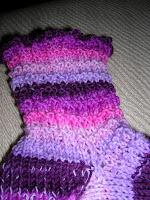 Yes, these wicked girly socks had to have a wicked girly looking bind-off. I found this very informative video from YouTube on how to do a picot bind off. Very stretchy, maybe too much. I'm afraid these might slide down. But I think these might fold down to make a cute little bobbi sock. So yes, even though I am not a big fan of Valentine's Day, I now have a pair of Valentines Day socks. Unintentionally made so. I'm still thinking of a name. I was going to call them something along the lines of Valentine's UpChucked Socks. But really, the yarn is pretty. Just wicked girly. And the ruffled edges just scream "Like OMG!". So as soon as I come up with a name I will edit this post with the name.